What Dickens event are you going to? Whether you are participating in a Dickens Fair, are part of a Victorian caroling group, or are part of a Dickens production, such as A Christmas Carol, it’s important for a lady to know how to dress the part! We’re here to wrap it all up for you, maybe even in a big beautiful Victorian bow. And, we want to know about your Dickens event or group. Post in the comments section below (include a link, if available, so we can all visit!). We’d love to feature Dickens events in a blog post, perhaps even our next one! When participating in a Dickens Fair or other Dickens event, it is important to remember that the Victorians sported neither tattoos nor body piercings. You’ll probably be asked to remove your piercings and cover your tattoos. Covering tattoos shouldn’t be too difficult as the Victorians covered most of their bodies with lots of clothes. Women were covered from the hats on their heads to the gloves on their hands to the stockings and boots on their feet. In between were layers upon layers of petticoats (even hoop crinolines were covered with at least one petticoat). So, where to start your character for a Dickens event? It starts with the silhouette and the silhouette begins with underpinnings (a fancy Victorian way of saying “underwear”). What kind of underpinnings are we talking about? First stockings or over-the-knee socks – “made of silk, cotton, or wool they came in vertical stripes, horizontal, stripes, checks, plaid tartan and windowpane in both small and large prints. “ (Victorian Stockings, Socks, Hosiery, Tights) Even though they were never seen, these colorful leg coverings created a little excitement for the wearer. Pantaloons, pantalets or drawers on the bottom – whatever you call them, they go next to the skin and over the stockings before the petticoats. A corset – worn by upper-class women but not usually worn by middle and lower-class women. A corset cover, or short-sleeved top, goes over the corset. A chemise is an alternative for those not wearing a corset. It is also a short-sleeved top worn much like an undershirt. A break from underpinnings was needed to put boots. Once the petticoats went on, it was very difficult to put on your boots! Boots were very popular during the mid-19th century. Most boots were mid-calf or lower and laced up. Next – the petticoats. Do you know why the hoop crinoline was developed? Because women were wearing six or seven petticoats under their dresses to create that bell shape for their skirts. Who wants to be weighed down by that many undergarments? Plus, it had to be hot during summer! “The hoop skirt gained a foothold in the mid-1850s and eventually replaced the large number of petticoats formerly worn.” (Women’s Costume) The hoop was worm by mid and upper-class women. Check with your group to see how wide your skirt can be. You want to make an impression but still have room for others. The tops of women’s dresses had high necklines, especially for day wear. Pagoda or bell ¾ sleeves were very popular. White undersleeves would often be worn to help protect the top. They are removable for easy cleaning. Form-fitting jackets were also a popular style for tops. Tops “were either collar-less or had a small Peter Pan style collar, made of self-fabric or a detachable knitted or crocheted one.” (Women’s Costume) The bolero jacket was also very popular during this time period. Lower-class women and sometimes women of greater means wore white cotton front-button blouses. The blouses might be embroidered or lace-trimmed. The blouse alone was too informal for the mid-Victorian woman. Blouses were always covered by a jacket. When creating a dress, the bodice, or top, and the skirt would be made of the same material. Depending on your group, you may need to seek out era-appropriate fabrics, especially prints. Skirts were very full to create the bell shape. Skirts were plain, flounced, or ruffled. A Victorian woman wasn’t dressed to leave the house without a hat. Mob caps were worn indoors to protect hair from dirt. They were easy to launder. Lower-class women would also wear them outdoors. Most women of Dickens wore bonnets when going out. There were many varieties of bonnets. Others wore elaborately-trimmed hats, but the bonnet was the dominant headwear of the period. A woman’s hands would also be covered when going outdoors. Gloves were made of kid leather or lace. Leather was often colored so it was common to purchase them to complement an outfit. Gloves worn during the day were generally short. When the weather was cold, a muff was used to keep the hands warm. Women of the Dickens period wore different jewelry for day and night. Cameos and pearls were very popular. Other popular jewelry included earrings, rings, brooches, and pins. Depending on the event, women would have carried a parasol or fan. Working-class women would have worn an apron. Now, you have an idea of what it takes to create a mid-1800s silhouette. Recollections is your source for your Dickens event. Here are a few of our fashions to spark your imagination. Civil War Styled Set – so very Dickens! Dickens Victorian Velvet Bonnet – keep your head warm! 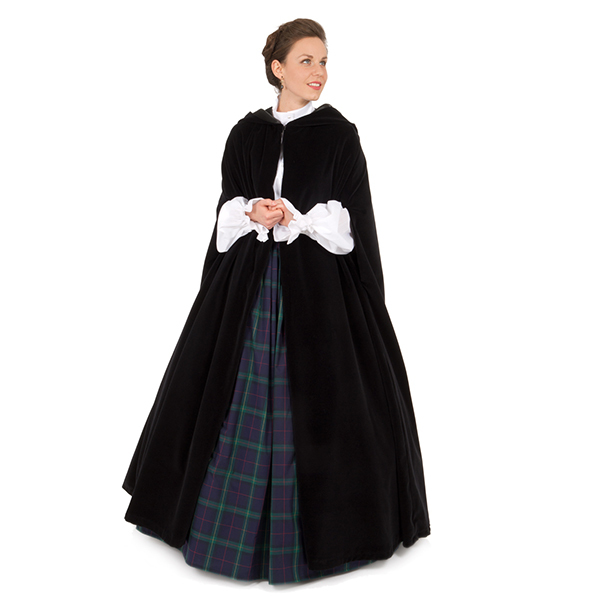 Victorian Velvet Cape – classic Dickens! Dickens Fair, each Feb in Riverside CA—including dance lessons, a ball and a fantastic fashion show.